The management of retinoblastoma (RB) has dramatically changed over the past two decades from previous radiotherapy methods to current chemotherapy strategies. RB is a remarkably chemotherapy-sensitive tumor. Chemotherapy is currently used as a first-line approach for children with this malignancy and can be delivered by intravenous, intra-arterial, periocular, and intravitreal routes. The choice of route for chemotherapy administration depends upon the tumor laterality and tumor staging. Intravenous chemotherapy (IVC) is used most often in bilateral cases, orbital RB, and as an adjuvant treatment in high-risk RB. Intra-arterial chemotherapy (IAC) is used in cases with group C or D RB and selected cases of group E tumor. Periocular chemotherapy is used as an adjunct treatment in eyes with group D and E RB and those with persistent/recurrent vitreous seeds. Intravitreal chemotherapy is reserved for eyes with persistent/recurrent vitreous seeds. 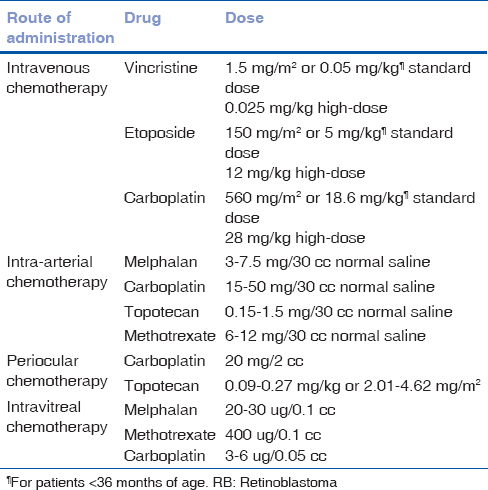 In this review, we describe the various forms of chemotherapy used in the management of RB. A database search was performed on PubMed, using the terms "RB," and "treatment," "chemotherapy," "systemic chemotherapy," "IVC," "IAC," "periocular chemotherapy," or "intravitreal chemotherapy." Relevant English language articles were extracted, reviewed, and referenced appropriately. Retinoblastoma (RB) has emerged as a malignancy with one of the highest survival rates among all pediatric cancers, owing to improving treatment methods over the years. ,, There is a major shift from globe-sacrificing methods to globe-saving alternatives in the treatment of most cases, using novel techniques of chemotherapy. Chemotherapy can be delivered by intravenous, intra-arterial, periocular, and intravitreal routes. The choice of route of chemotherapy administration depends upon the tumor laterality and tumor staging. In this review, we will discuss the methods of chemotherapy. A database search was performed on PubMed, using the terms "RB," and "treatment," "chemotherapy," "systemic chemotherapy," "intravenous chemotherapy (IVC)," "intra-arterial chemotherapy (IAC)," "periocular chemotherapy," or "intravitreal chemotherapy." Relevant English language articles were extracted, reviewed, and referenced appropriately. Reduction of long-term second nonocular cancers. Intravenous chemotherapy is the treatment of choice in bilateral cases of RB. 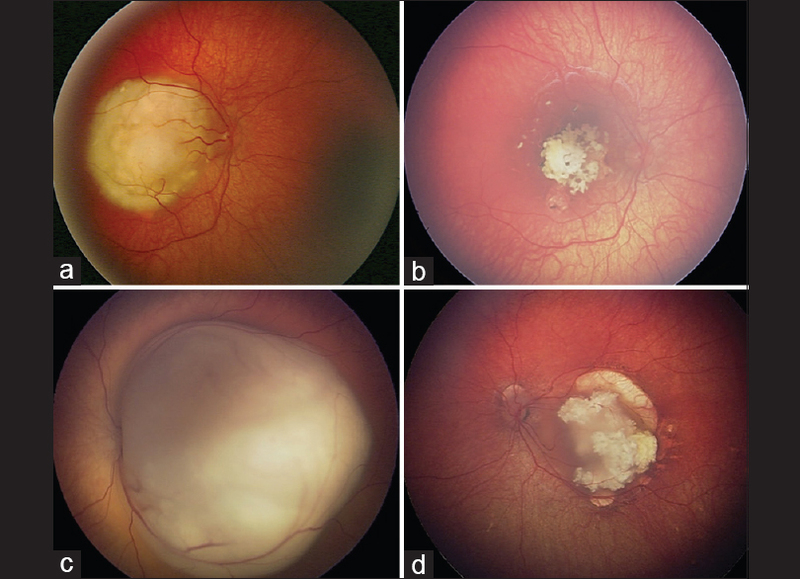 In these cases with germline mutation, in addition to intraocular tumor control, IVC also prevents the occurrence of pinealoblastoma and reduces the incidence of long-term second nonocular cancers to 4% at 11 years. ,, These additional benefits could be a direct effect of IVC or indirect benefit by avoidance of EBRT. High-risk RB identified from histopathologic factors from enucleated eyes predicts the development of metastatic disease and related mortality. ,,, Patients demonstrating such risk factors are given postenucleation adjuvant IVC as chemoprophylaxis for protection from presumed systemic micrometastases and related death. Cisplatin-induced ototoxicity is reported in 0-17% cases. , Properly dosed carboplatin in children with RB result in rare occurrences of hearing deficit. Etoposide-induced secondary acute myelogenous leukemia has been reported in the literature; however, the incidence of IVC induced secondary acute myeloid leukemia is very low. , Though IVC-induced infertility has been speculated, there is no evidence supporting this with our protocol of VEC. Our personal experience using proper dosing of IVC reveals excellent tumor control with minimal toxicities and no fertility issues. Intra-arterial chemotherapy causes minimal systemic side-effects. Transient neutropenia develops in 11% patients after IAC that does not require transfusion. , Owing to minimal systemic absorption of drugs, IAC offers no protection against systemic metastasis, pinealoblastoma, and second cancers. Of 78 patients treated with IAC, two children developed systemic metastasis. Local side-effects at the injection site and carotid spasm can also occur. Inomata and Kaneko found melphalan to be the most sensitive chemotherapeutic agent against RB based on in vitro testing of 12 agents, and a dose of 4 ug/ml achieved complete tumor suppression [Figure 5]. In the rabbit model, the concentration of 5.9 μg/ml showed no retinal toxicity, and this correlates to human vitreous doses of 20-30 ug. These findings have prompted 20-30 ug melphalan as the drug of choice for intravitreal chemotherapy, with minimal ocular complications and no significant electroretinogram changes at this dose. , Dose greater than 50 ug is associated with severe ocular complications. Satisfactory results have also been reported with an intravitreal methotrexate, carboplatin and topotecan ,, [Table 2]. In the recent times, the use of intravitreal chemotherapy through pars plana route for recurrent/residual vitreous seeds has shown promising results ,,,,,,,,,, [Table 1]. The management of RB has evolved over the years with improving methods of treatment. The combination of various treatment modalities is likely to increase the rate of tumor control and globe salvage. The treatment of intraocular RB is likely heading in the direction of a combination of IVC and IAC along with focal treatments such as cryotherapy and transpupillary thermotherapy. Periocular chemotherapy and intravitreal chemotherapy are promising adjunct therapies in refractory cases. Young JL, Smith MA, Roffers SD, Liff JM, Bunin GR. Retinoblastoma. In: Ries LA, Smith MA, Gurney JG, Linet M, Tamra T, Young JL, et al., editors. Cancer Incidence and Survival among Children and Adolescents: United States SEER Program 1975-1995. Maryland: National Cancer Institute, SEER Program; 2012. Ramasubramanian A, Shields CL, editors. Epidemiology and magnitude of the problem. Retinoblastoma. New Delhi, India: Jaypee Brothers Medical Publishers; 2012. p. 10-5. Shields JA, Shields CL, editors. Retinoblastoma. Intraocular Tumors. An Atlas and Textbook. 2 nd ed. Philadelphia, PA: Lippincott Williams Wilkins; 2008. p. 293-365. Shields CL, De Potter P, Himelstein BP, Shields JA, Meadows AT, Maris JM. Chemoreduction in the initial management of intraocular retinoblastoma. Arch Ophthalmol 1996;114:1330-8. Murphree AL, Villablanca JG, Deegan WF 3 rd , Sato JK, Malogolowkin M, Fisher A, et al. Chemotherapy plus local treatment in the management of intraocular retinoblastoma. Arch Ophthalmol 1996;114:1348-56. Kingston JE, Hungerford JL, Madreperla SA, Plowman PN. Results of combined chemotherapy and radiotherapy for advanced intraocular retinoblastoma. Arch Ophthalmol 1996;114:1339-43. Honavar SG, Singh AD. Management of advanced retinoblastoma. Ophthalmol Clin North Am 2005;18:65-73, viii. Kaliki S, Shields CL, Shah SU, Eagle RC Jr, Shields JA, Leahey A. Postenucleation adjuvant chemotherapy with vincristine, etoposide, and carboplatin for the treatment of high-risk retinoblastoma. Arch Ophthalmol 2011;129:1422-7. Leal-Leal CA, Rivera-Luna R, Flores-Rojo M, Juárez-Echenique JC, Ordaz JC, Amador-Zarco J. Survival in extra-orbital metastatic retinoblastoma: Treatment results. Clin Transl Oncol 2006;8:39-44. Shields CL, Shields JA, DePotter P, Himelstein BP, Meadows AT. 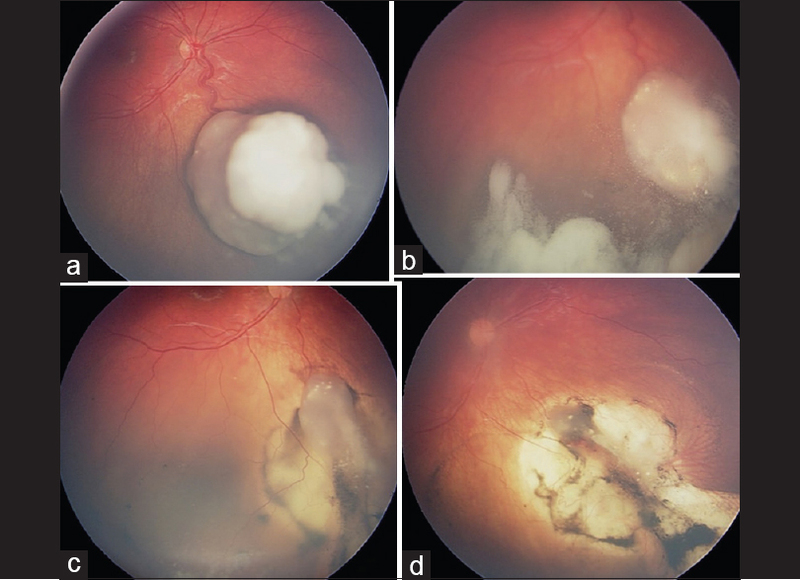 The effect of chemoreduction on retinoblastoma-induced retinal detachment. J Pediatr Ophthalmol Strabismus 1997;34:165-9. Turaka K, Shields CL, Leahey A, Meadows AT. Second malignant neoplasms following chemoreduction for retinoblastoma in 272 patients. Pediatr Blood Cancer 2012;59:121-5. Kupfer C. Retinoblastoma treated with intravenous nitrogen mustard. Am J Ophthalmol 1953;36:1721-3. Narang S, Mashayekhi A, Rudich D, Shields CL. Predictors of long-term visual outcome after chemoreduction for management of intraocular retinoblastoma. Clin Experiment Ophthalmol 2012;40:736-42. Wilson TW, Chan HS, Moselhy GM, Heydt DD Jr, Frey CM, Gallie BL. Penetration of chemotherapy into vitreous is increased by cryotherapy and cyclosporine in rabbits. Arch Ophthalmol 1996;114:1390-5. Villablanca JG, Jubran R, Murphree AL. Phase I Study of Subtenon Carboplatin with Systemic High dose Carboplatin/Etoposide/Vincristine (CEV) for Eyes with Disseminated Intraocular Retinoblastoma (RB). [Abstract] Proceedings of XIII Biannual Meeting of ISGED and the X International Symposium on Retinoblastoma, Fort Lauderdale, Fl, USA; May 4, 2001. Shields CL, Ramasubramanian A, Thangappan A, Hartzell K, Leahey A, Meadows AT, et al. Chemoreduction for group E retinoblastoma: Comparison of chemoreduction alone versus chemoreduction plus low-dose external radiotherapy in 76 eyes. Ophthalmology 2009;116:544-51.e1. Zhao J, Dimaras H, Massey C, Xu X, Huang D, Li B, et al. Pre-enucleation chemotherapy for eyes severely affected by retinoblastoma masks risk of tumor extension and increases death from metastasis. J Clin Oncol 2011;29:845-51. Ellsworth RM. Orbital retinoblastoma. Trans Am Ophthalmol Soc 1974;72:79-88. Grabowski EF, Abramson DH. Intraocular and extraocular retinoblastoma. Hematol Oncol Clin North Am 1987;1:721-35. Honavar SG. Orbital Retinoblastoma. In: Ramasubramanian A, Shields CL, editors. Retinoblastoma. New Delhi, India: Jaypee Brothers Medical Publishers; 2012. p. 167-78. Badhu B, Sah SP, Thakur SK, Dulal S, Kumar S, Sood A, et al. Clinical presentation of retinoblastoma in Eastern Nepal. Clin Experiment Ophthalmol 2005;33:386-9. Singh AD, Shields CL, Shields JA. Prognostic factors in retinoblastoma. J Pediatr Ophthalmol Strabismus 2000;37:134-41. Goble RR, McKenzie J, Kingston JE, Plowman PN, Hungerford JL. Orbital recurrence of retinoblastoma successfully treated by combined therapy. Br J Ophthalmol 1990;74:97-8. Doz F, Khelfaoui F, Mosseri V, Validire P, Quintana E, Michon J, et al. The role of chemotherapy in orbital involvement of retinoblastoma. The experience of a single institution with 33 patients. Cancer 1994;74:722-32. Shields CL, Shields JA, Baez K, Cater JR, De Potter P. Optic nerve invasion of retinoblastoma. Metastatic potential and clinical risk factors. Cancer 1994;73:692-8. Shields CL, Shields JA, Baez KA, Cater J, De Potter PV. 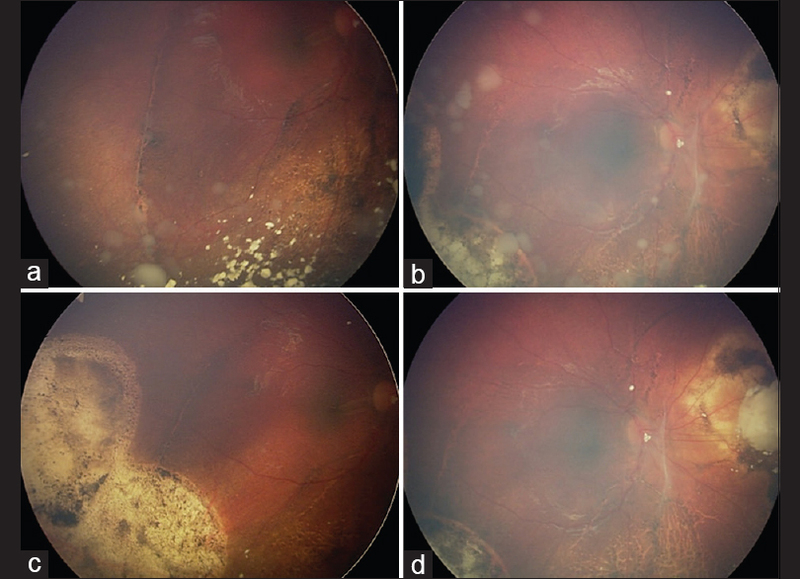 Choroidal invasion of retinoblastoma: Metastatic potential and clinical risk factors. Br J Ophthalmol 1993;77:544-8. Messmer EP, Heinrich T, Höpping W, de Sutter E, Havers W, Sauerwein W. Risk factors for metastases in patients with retinoblastoma. Ophthalmology 1991;98:136-41. Khelfaoui F, Validire P, Auperin A, Quintana E, Michon J, Pacquement H, et al. Histopathologic risk factors in retinoblastoma: A retrospective study of 172 patients treated in a single institution. Cancer 1996;77:1206-13. Jubran RF, Erdreich-Epstein A, Butturini A, Murphree AL, Villablanca JG. Approaches to treatment for extraocular retinoblastoma: Children's Hospital Los Angeles experience. J Pediatr Hematol Oncol 2004;26:31-4. Cozza R, De Ioris MA, Ilari I, Devito R, Fidani P, De Sio L, et al. Metastatic retinoblastoma: Single institution experience over two decades. Br J Ophthalmol 2009;93:1163-6. Günalp I, Gündüz K, Arslan Y. Retinoblastoma in Turkey: Diagnosis and clinical characteristics. Ophthalmic Genet 1996;17:21-7. Dunkel IJ, Jubran RF, Gururangan S, Chantada GL, Finlay JL, Goldman S, et al. Trilateral retinoblastoma: Potentially curable with intensive chemotherapy. Pediatr Blood Cancer 2010;54:384-7. Dunkel IJ, Chan HS, Jubran R, Chantada GL, Goldman S, Chintagumpala M, et al. High-dose chemotherapy with autologous hematopoietic stem cell rescue for stage 4B retinoblastoma. Pediatr Blood Cancer 2010;55:149-52. Dunkel IJ, Khakoo Y, Kernan NA, Gershon T, Gilheeney S, Lyden DC, et al. Intensive multimodality therapy for patients with stage 4a metastatic retinoblastoma. Pediatr Blood Cancer 2010;55:55-9. Chantada GL, Leal-Leal CA, Dunkel IJ. Metastatic retinoblastoma. In: Ramasubramanian A, Shields CL, editors. Retinoblastoma. New Delhi, India: Jaypee Brothers Medical Publishers; 2012. p. 186-90. Qaddoumi I, Bass JK, Wu J, Billups CA, Wozniak AW, Merchant TE, et al. Carboplatin-associated ototoxicity in children with retinoblastoma. J Clin Oncol 2012;30:1034-41. Turaka K, Shields CL, Meadows AT, Leahey A. Second malignant neoplasms following chemoreduction with carboplatin, etoposide, and vincristine in 245 patients with intraocular retinoblastoma. Pediatr Blood Cancer 2012;59:121-5. Kaneko A. Japanese contributions to ocular oncology. Int J Clin Oncol 1999;4:321-6. Abramson DH, Dunkel IJ, Brodie SE, Kim JW, Gobin YP. A phase I/II study of direct intraarterial (ophthalmic artery) chemotherapy with melphalan for intraocular retinoblastoma initial results. Ophthalmology 2008;115:1398-404.e1. Shields CL, Manjandavida FP, Pieretti G, Arepalli SA, Jabbour P, Shields JA. Intra-arterial chemotherapy for retinoblastoma: Use as primary or secondary therapy in 70 eyes. Ophthalmology 2014;121:1453-60. 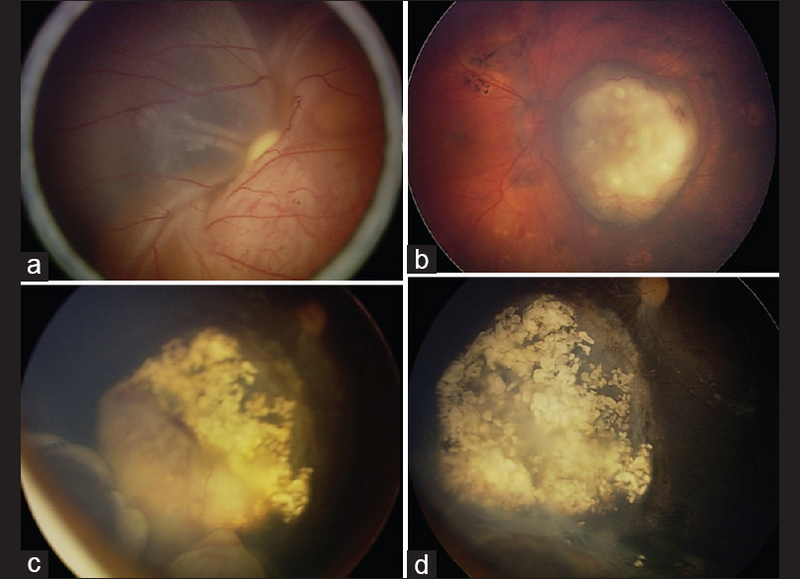 Munier FL, Beck-Popovic M, Balmer A, Gaillard MC, Bovey E, Binaghi S. Occurrence of sectoral choroidal occlusive vasculopathy and retinal arteriolar embolization after superselective ophthalmic artery chemotherapy for advanced intraocular retinoblastoma. Retina 2011;31:566-73. Shields CL, Kaliki S, Al-Dahmash S, Rojanaporn D, Leahey A, Griffin G, et al. Management of advanced retinoblastoma with intravenous chemotherapy then intra-arterial chemotherapy as alternative to enucleation. Retina 2013;33:2103-9. Francis JH, Gobin YP, Dunkel IJ, Marr BP, Brodie SE, Jonna G, et al. Carboplatin +/-topotecan ophthalmic artery chemosurgery for intraocular retinoblastoma. PLoS One 2013;8:e72441. Wilson MW, Qaddoumi I, Billups C, Haik BG, Rodriguez-Galindo C. A clinicopathological correlation of 67 eyes primarily enucleated for advanced intraocular retinoblastoma. Br J Ophthalmol 2011;95:553-8. Kaliki S, Shields CL, Rojanaporn D, Al-Dahmash S, McLaughlin JP, Shields JA, et al. High-risk retinoblastoma based on international classification of retinoblastoma: Analysis of 519 enucleated eyes. Ophthalmology 2013;120:997-1003. Shields CL, Kaliki S, Shah SU, Bianciotto CG, Jabbour P, Shields JA. Effect of intraarterial chemotherapy on retinoblastoma-induced retinal detachment. Retina 2012;32:799-804. Muen WJ, Kingston JE, Robertson F, Brew S, Sagoo MS, Reddy MA. Efficacy and complications of super-selective intra-ophthalmic artery melphalan for the treatment of refractory retinoblastoma. Ophthalmology 2012;119:611-6. Vajzovic LM, Murray TG, Aziz-Sultan MA, Schefler AC, Wolfe SQ, Hess D, et al. Supraselective intra-arterial chemotherapy: Evaluation of treatment-related complications in advanced retinoblastoma. Clin Ophthalmol 2011;5:171-6. Venturi C, Bracco S, Cerase A, Cioni S, Galluzzi P, Gennari P, et al. Superselective ophthalmic artery infusion of melphalan for intraocular retinoblastoma: Preliminary results from 140 treatments. Acta Ophthalmol 2013;91:335-42. Bianciotto C, Shields CL, Iturralde JC, Sarici A, Jabbour P, Shields JA. Fluorescein angiographic findings after intra-arterial chemotherapy for retinoblastoma. Ophthalmology 2012;119:843-9. Francis JH, Abramson DH, Gobin YP, Marr BP, Dunkel IJ, Riedel ER, et al. Electroretinogram monitoring of dose-dependent toxicity after ophthalmic artery chemosurgery in retinoblastoma eyes: Six year review. PLoS One 2014;9:e84247. Harbour JW, Murray TG, Hamasaki D, Cicciarelli N, Hernández E, Smith B, et al. Local carboplatin therapy in transgenic murine retinoblastoma. Invest Ophthalmol Vis Sci 1996;37:1892-8. Mendelsohn ME, Abramson DH, Madden T, Tong W, Tran HT, Dunkel IJ. Intraocular concentrations of chemotherapeutic agents after systemic or local administration. Arch Ophthalmol 1998;116:1209-12. Mao Y, Wu Z, Yang H, Lin S, Zheng J. Measurement of intraocular concentrations of etoposide after systemic and local administration. Yan Ke Xue Bao 2004;20:178-80, 186. Carcaboso AM, Bramuglia GF, Chantada GL, Fandiño AC, Chiappetta DA, de Davila MT, et al. Topotecan vitreous levels after periocular or intravenous delivery in rabbits: An alternative for retinoblastoma chemotherapy. Invest Ophthalmol Vis Sci 2007;48:3761-7. Schefler AC, Braich PS. Local chemotherapy. In: Ramasubramanian A, Shields CL, editors. Retinoblastoma. New Delhi, India: Jaypee Brothers Medical Publishers; 2012. p. 99-108. Marr BP, Dunkel IJ, Linker A, Abramson DH. Periocular carboplatin for retinoblastoma: Long-term report (12 years) on efficacy and toxicity. Br J Ophthalmol 2012;96:881-3. Mallipatna AC, Dimaras H, Chan HS, Héon E, Gallie BL. Periocular topotecan for intraocular retinoblastoma. Arch Ophthalmol 2011;129:738-45. Ericson LA, Rosengren BH. 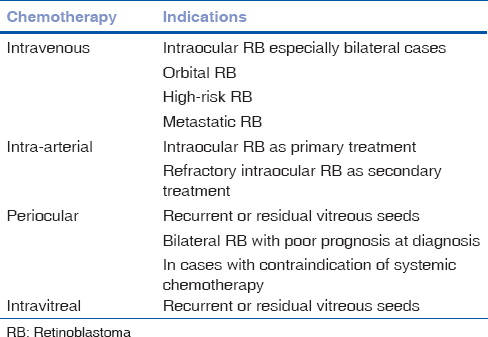 Present therapeutic resources in retinoblastoma. Acta Ophthalmol (Copenh) 1961;39:569-76. Brodie SE, Munier FL, Francis JH, Marr B, Gobin YP, Abramson DH. Persistence of retinal function after intravitreal melphalan injection for retinoblastoma. Doc Ophthalmol 2013;126:79-84. Kivelä T, Eskelin S, Paloheimo M. Intravitreal methotrexate for retinoblastoma. Ophthalmology 2011;118:1689.e1-6. Smith SJ, Pulido JS, Salomão DR, Smith BD, Mohney B. Combined intravitreal and subconjunctival carboplatin for retinoblastoma with vitreous seeds. Br J Ophthalmol 2012;96:1073-7. Buitrago E, Del Sole MJ, Torbidoni A, Fandino A, Asprea M, Croxatto JO, et al. Ocular and systemic toxicity of intravitreal topotecan in rabbits for potential treatment of retinoblastoma. Exp Eye Res 2013;108:103-9. Seregard S, Singh AD. Retinoblastoma: Direct chemotherapeutic drug delivery into the vitreous cavity. Br J Ophthalmol 2012;96:473-4. Munier FL, Gaillard MC, Balmer A, Beck-Popovic M. Intravitreal chemotherapy for vitreous seeding in retinoblastoma: Recent advances and perspectives. Saudi J Ophthalmol 2013;27:147-50. Kaneko A, Suzuki S. Eye-preservation treatment of retinoblastoma with vitreous seeding. Jpn J Clin Oncol 2003;33:601-7. Smith SJ, Smith BD, Mohney BG. Ocular side effects following intravitreal injection therapy for retinoblastoma: A systematic review. Br J Ophthalmol 2014;98:292-7.